This 16th century Grade 2 Elizabethan manor house mixes comfort with charm and boasts a restaurant awarded two prestigious AA Rosettes. Mortons house is located in the heart of Corfe Castle, and is surrounded by the beautiful Dorset countryside. Ideal for those wishing to enjoy a relaxing break, with the added bonus of must-see locations on your doorstep. Corfe is an unspoilt English village built in Purbeck stone and dominated by the ruins of the Norman Castle. It is the capital of the Isle of Purbeck and the site where Edward, first King of England was martyred in 978AD. The Purbeck coastline is designated an "Area of Outstanding Natural Beauty". The beaches of Studland, Lulworth, Swanage, Kimmeridge, Durdle Door and Old Harry are all within easy reach. 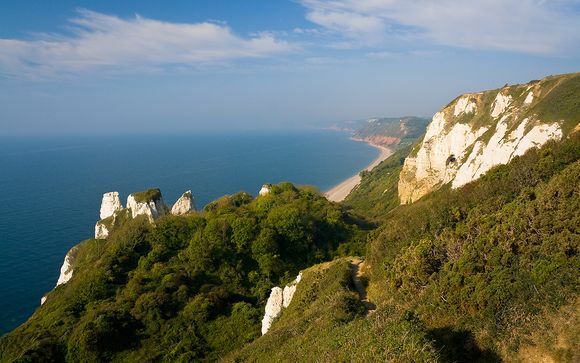 In December of 2001, the Dorset and East Devon Coast was officially ranked as one of the natural wonders of the world. The decision, taken by UNESCO's World Heritage Committee, puts the coast firmly on the map as one of the most geologically important places on the planet. The 95 mile stretch of coast, starting at Old Harry Rocks, near Swanage, provides a walk through some 185 million years of the history of the planet and contains a number of outstanding fossil deposits. Learn more about the rich natural history on a guided 'Jurassic Jaunt'. Nearby you can visit the smallest town hall in England and a small museum with wonderful archives that include a set of dinosaur prints and a collection of domestic and agriculture implements. You will find this just around the corner in West Street opposite the Fox Inn. On the same street as the museum is a fantastic model village which is well worth a visit. It shows the village in its glory including the Castle before Oliver Cromwell made his grand entrance! Mortons House is one of the earliest in Corfe and perhaps the finest. Dating back to circa 1590, the house was originally known as 'Dacombs', after William Dacomb. It is on the door step of some must-see locations along the Jurassic Coast with the beautiful beaches at Studland, Swanage and Lulworth being just a short drive away, not to mention the steam train to Swanage passing by the hotel garden! 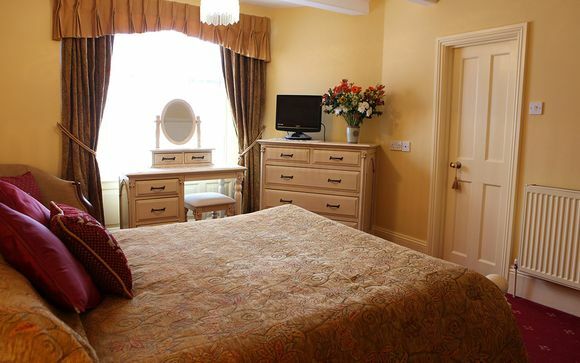 This offer is based on a stay in a Standard Room. Each Standard Room is individually decorated with its own unique style and charm. Some are located in the original manor and some have Castle views. All have private bathroom, television, tea and coffee making facilities and quality courtesy products. Mortons House is proud of the commendations received for its traditional English cuisine. It has been awarded two prestigious AA Rosettes for its fine dining restaurant. The chef takes care to source from local producers where possible, and the menu is supported by an excellent wine list. Car - There is a large private car park, which is complimentary to all guests. The village of Corfe Castle is located on the A351 between Wareham and Swanage. As you enter Corfe Castle, follow the road through the village. The hotel is located on the left hand side, just past ‘Gallery at 41’. Rail - Wareham train station is approximately 4 miles from the hotel. There is a taxi rank outside or alternatively call the hotel. Air - Bournemouth Airport is approximately 20 miles from the hotel (approximately 40 minutes by car or taxi).